The city of Peterborough is to the west of Eye and has a population of 180,000. People have been in the area since the Bronze Age. At nearby Flag Fen Bronze Age Centre archaeologists found a one-kilometre long wooden trackway that was built between 1350 and 950 BC. The rise of the modern city began with a monastery which was built in 656AD. 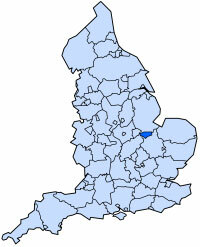 Peterborough was called Medehamstede by the Saxons until 963AD. Click on the image to the left is part of the Peterborough Chronicle, otherwise known as the Laud Manuscript. The Peterborough Chronicle was written during the time of the Anglo-Saxons. It contains unique information about the history of England after the Norman Conquest in the 11th Century. To the east are the fens, the River Nene flows through the city from west to east and the East Coast Main Line and Great Northern Road, the A1, Euroroute E15, run from north to south. 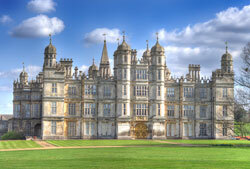 Peterborough is 43 miles northeast of Northampton and 76 miles north of London. In 1821 the population was said to be 4,598. 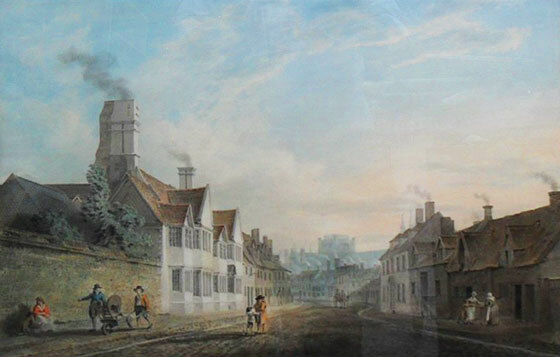 Peterborough had been a small cathedral and market town for centuries before the 1840’s when the railway arrived, at that time the town didn’t even have a Mayor. Robert Stephenson (son of George Stephenson who was an English civil engineer and mechanical engineer who built the first public railway line in the world to use steam locomotives, and he is renowned as being the “Father of Railways”) surveyed the line in 1843 before building commenced. The arrival of the train turned Peterborough into one of the key urban centres in the East of England. It was reported that a crowd of 8,000 turned out to watch watched the first train arrive. The beginnings of the Peterborough we know today was built on the railway. The next big change came in 1968 when the Peterborough Development Corporation was established after the government had designated the city as a new town. The challenge was to provide homes, work and services for an additional 70,000 people. Entire villages such as Gunthorpe and Orton Waterville were swallowed up in the developments. The same growth was not seen again until the development of the Hamptons in this century. The Nene Valley Railway runs steam trains from Peterborough to Yarwell on the part of the first railway line to reach Peterborough in the 1800s. There are also plenty of green places to visit from the award-winning Central Park to Ferry Meadows and not forgetting the £11 million Green Wheel cycle network. Peterborough also has a wide range of restaurants and nightclubs. There is also the CAMRA Beer Festival, the second largest beer festival in the UK, and the Heritage Festival, the largest heritage festival of its type in the UK. 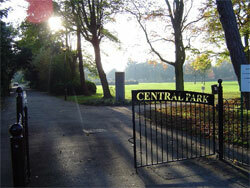 The city also has a theatre, greyhound stadium and multi-screen Cinema in the city. Top five places to visit.